"Salmon and grated ginger with sesame oil are cooked on a bed of chopped carrots, then served on fresh spinach leaves." Center one-fourth of onion slices and carrots on each sheet of Reynolds Wrap(R) Non-Stick Foil. Top with salmon. Sprinkle with ginger; drizzle with vinegar and oil. Sprinkle with salt and pepper to taste. Bake 16 to 20 minutes on a cookie sheet in oven. 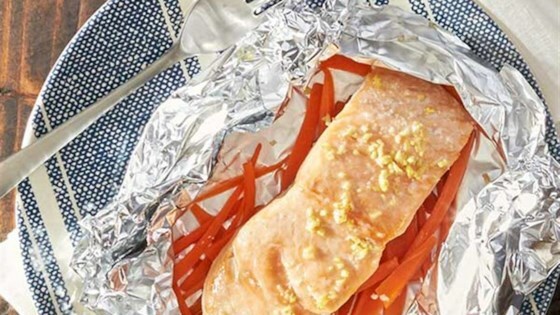 Serve salmon and carrots on a bed of spinach. Sprinkle with additional seasoned rice vinegar, if desired. I changed the proportions of this recipe, and had to cook it for half an hour, but it was amazing, especially for such a simple recipe. Very moist, with a subtle flavor. Excellent. Added some red pepper flakes before baking. Very moist and flavorful. Loved it! I'm not a huge salmon fan but ths tasted great! Added a few chili flakes for some heat but that was the only adjustment I made. It was wonderful! I’m so happy I tried this recipe. I didn’t have grated ginger, so I used puréed ginger. It still came out great. This was surprisingly bland. I thought with the fresh ginger and sesame oil it would have delivered more flavor. I don't think I'll be making this again.